Today’s shoppers are more empowered than ever before. They expect the products they buy to be meaningful and they expect brands to reflect their values. This new consumer engagement framework has to some extent been driven by the continued adoption of consumer-driven technology. They are always ‘on’ – connected to each other, and to their favorite brands, at all times. This is, perhaps, unsurprising since the number of gadgets on Earth has already surpassed the number of people, and device production continues to grow five times faster than the global population. This has helped consumers to become more informed, conscious and curious – they want to know where their products come from, and whether they are ethically sourced, recyclable, and sustainable. And they are open to new experiences. The real world and the digital world have collided and the barriers to engaging with new technologies have all but disappeared. Today’s consumers are more than willing to experiment if they think the experience will be worth it. Ultimately though, if there’s one characteristic that defines modern consumer behavior – it’s that they have very high expectations. Anywhere. Anytime. Made for me. Discover the new challenges raised by the evolution of consumer expectations, in search of personalization and experience, in this whitepaper. Learn how to solve the resulting complex puzzle: reconcile back-end and front-end. Consumers expect experiences that react to the context of their situation, wherever they are – whether that’s on Instagram, Facebook, a brand’s smartphone app or in a physical store. And they expect these experiences to be intuitive and continuously responding to their own evolving needs. There’s also a big demand for products that fit seamlessly into our lives. Modern kitchens, for example, are now kitted out with appliances that ‘talk’ to us. A counter top that weighs your ingredients and suggests the ideal cooking temperature and time in the oven. A tumble dryer that alerts you when the clothes are dry or when it needs a service. These devices offer so much more than their fundamental purpose – they’re now interacting with us. Designed and modeled entirely within the 3DEXPERIENCE® platform, "Nestor", a new kitchen robot, is the culmination of the latest design thinking. From ideation through to final design, CAD data is leveraged within the platform every step of the way – for modeling, visualization and the creation of compelling marketing content and consumer experiences. See below how data continuity is used to go from concept to marketing experience. Click and hold your mouse button or use your finger to rotate left or right. Increasingly, this trend is moving in store and into the physical space. New technologies are making it possible to create truly special and unique omni-channel experiences. A good example is sports retailer Decathlon, who have fundamentally re-framed their approach to the in-store experience. Two popular words have emerged in this domain: personalization and customization. While many brands have fallen into a bad habit of using them interchangeably, they have, in fact, different meanings and implications. Personalization is an aesthetic adaption or configuration of a product to suit a consumer preferences, and has little to no effect on the product’s engineering. For example, engraving the consumer’s name on the surface of a bike, or adding a sticker on a kitchen equipment to match the colors and the style of the kitchen: this is personalization. Customization is where the product’s composition is altered – or re-engineered, making it unique and capable of fulfilling a specific consumer requirement. In the case of customization, we see more and more projects in footwear for example, where the sole, or the mid-sole is tailored-made and produced on demand to fit one consumer’s particular need. ECCO, a world-leading brand of footwear, has developed a customization project, where an individual’s biomechanical data is combined with in-store additive manufacturing to create customized silicone midsoles, within two hours. Most importantly, there are opportunities in both personalization and customization to excite the consumer and keep them coming back for more. Stacy Glasgow, consumer trends analyst at Mintel, a market intelligence agency, believes new technologies and approaches that brands are pioneering today will further solidify consumers’ expectations for customization in future. In store, for example, retailers are using systems which can read shoppers’ emotions and provide deals based on real-time feelings. In the online and mobile space, retailers are using social media to better fulfill the needs of individuals, with initiatives such as using Facebook ‘likes’ to decide what goes on shelves and targeting Instagram users with personalized outfit recommendations based on their previously posted photos. One of the most pressing values of our time is sustainability. The consumer experience cannot come at any cost, especially to the planet. What’s more, the consumer expects transparency – they want to know where products come from, whether it was ethically sourced and what the brand’s values are. Take a common product, like a washing machine. It’s something you will find in most houses, a product that uses a high-level amount of water and electricity and, if we’re unlucky, has to be replaced and even repaired relatively often. The design and manufacturing of products like washing machines will have to evolve in line with consumer expectations. That is exactly what the French start-up L’Increvable is hoping to do. L’Increvable has made it its mission to create a smarter, more sustainable, eco-friendlier appliance using an approach they call Eco-design for End-of-Life. Made by Julien Phedyaeff and Christopher Santerre, both students at ENSCI - Les Ateliers, the device is fully repairable, as every piece is removable and changeable. What’s more it is connected to allow for software updates and predictive maintenance. Using the latest technology, the design actually anticipates the repair and the recycling of the product – making it less expensive in the long term and more efficient. Of course, as well as wanting the perfect product specifically tailored to their needs and environmentally conscious, demanding consumers also want it now. We might call it the Amazon effect – consumers want their products at the right time, the right place and the right moment. Brands will have to overcome the challenges that this inevitably brings, and be ready and able to deliver products anywhere, anytime – all the while anticipating demand and dealing with general market volatility. It goes without saying that this will require a high degree of planning and foresight. A number of innovative tools are emerging to help brands realize these ambitions. 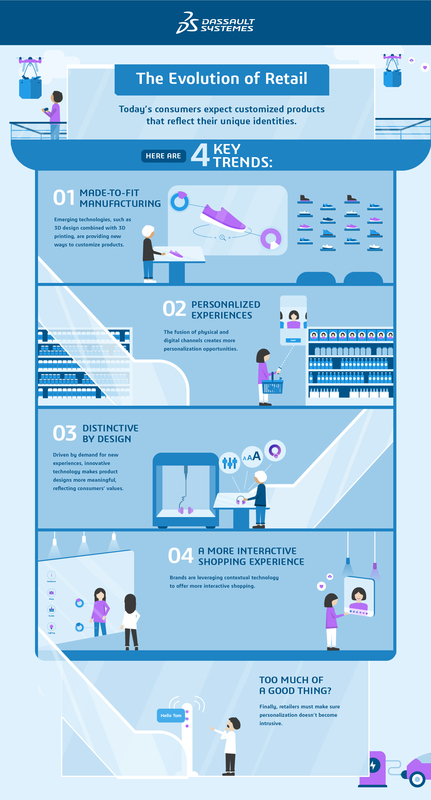 With solutions like Dassault Systèmes 3DEXPERIENCE® platform, consumers can digitally configure their dream product – its color, fabric, trims and accessories – online or in a store’s immersive showroom and display its cost and availability in real time. But they can also go a step further, changing the shape, the design, adapting to their personal datas, thus creating completely customized product impacting the engineering. And this is all possible with 3D and virtual worlds. On the other side, merchandisers need to define the store's look and ensure they can consistently deploy their vision. Retailers and brands can leverage the power of 3D to engage in virtual merchandizing, assortment planning and validation. Designers, merchants, space and category managers can be immerged into a virtual store, online or through virtual reality – to collaborate in real-time and review, iterate and validate different options for product assortment and even take a walk-through from the consumer’s perspective. Once you have software that allows you to create the perfect personalized product, you then need to deliver. Brands and retailers need tools that allow for intelligent planning from demand to delivery – providing essential real-time access to information for the entire value chain. They need to fulfill consumers’ ‘want it now’ expectations while mitigating delays and unwelcome costs. Pandora, the world’s largest jewelry manufacturer by volume, has also used Quintiq Solutions to expand its business operations. With Quintiq’s advanced planning system supporting our capacity expansion program, we will be able to scale up manufacturing capacity, increase our efficiency and increase agility to satisfy the demands of our valued customers. Corporate working practices must change with the ever-changing consumer world. The way forward is to adopt agile processes, modular configurable assets, new software development technologies and model-based engineering. Everything should be traceable: from consumer need to delivered product. And then, as long as we always remember to keep the consumer at the center of all our thoughts, we will have given our businesses the very best chance of success.